July 31, 2018 August 1, 2018 - by FallenAngel - 3 Comments. All eyes were suddenly focused on the change of Speaker of the House of Representatives. Pantaleon Alvarez was voted out by his colleagues, and the one who would take his place was former president Gloria Arroyo! Though detained for almost the entirety of former president BS Aquino’s term, not only did she win a seat in Congress, the charges brought up against her were eventually dismissed, presumably due to lack of evidence. The replacement for Alvarez is not necessarily friendly to the Yellowtards either, the loudest constituent of the Opposition. So that’s a double whammy for the resurgence of their relevance! 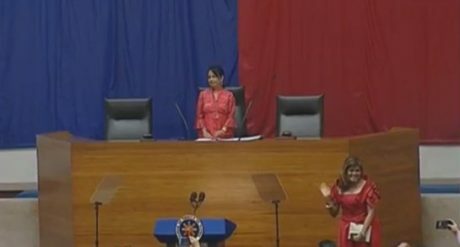 President Duterte delivered an address that was entirely in English. No swearing, and if there was any deviation from the prepared parts of the speech, it was hardly noticeable. No mention of the opposition either, so no figure among them was able to play the victim card and say that he/she was singled out by president Duterte! And, being delivered in English, it was more difficult for the mainstream media or other commentators to misconstrue, or take out of context. 2) Shriek to high heavens about Gloria Arroyo’s return to a bigger position of influence. Done without resorting to things like people power. 3) And of course, every time they see a Marcos (Imee in particular), they can’t help but scream about the Martial Law years. AGAIN. Yellowtards had a chance to put away the Marcoses and failed. Yellowtards had a chance to put away Gloria Arroyo and failed. What are they going to do differently this time, in order to succeed in ousting Duterte? Although there were quite a few quotable quotes from the speech itself, the key takeaway for me was this: It’s time for Filipinos to have a vision of a different and better future, for the succeeding generations. The Yellowtards and the opposition are relics of the past. Rather than propose a clear alternative to Duterte’s vision of the future, all they can do is merely employ fear, uncertainty and doubt in order to keep people from imagining anything other than the status quo. It’s a dishonest way of thinking to propagate: The Filipinos’ aversion to risk and fear of the unknown are being taken advantage of. Unless Filipinos can conquer their inability to regard the future with open minds, and their tendency to retreat to the past as a comfort zone, they will forever remain hobbled as a people. The Aquino Cojuangco political axis were the ones who trained the mindsets of most Filipinos, to become : Stupid. So that they can stay in political power forever. Look at these YellowTards; they are “allergic” to : Gloria Arroyo, and anything that appear like a Marcos. The Aquinos demonizing of their political enemies, came to the bad results of most Filipinos, especially their rabid followers, to become “Afraid” of the names of their political enemies. Mere mention of names of Arroyo or Marcos, bring “ANXIETIES” to them; and somewhat borders to “Mental Illness” to these people. The Aquino “Cult of Personalities” have already brought a negative impact on the mental conditions of most Filipinos, especially their followers. It would have been good, if Pnoy Aquino and Kris Aquino or any of the Aquino children were only ones with , the depression/anxiety illnesses. To give this mental illness to all Filipinos, is the most unkind way for the Aquinos to leave a legacy…Anyone needing “anti anxiety/anti depression medications” ? >>> Yellowtards had a chance to put away the Marcoses and failed. If the Philippines are not willing to risk the unusual, they will have to settle for the ordinary.